More than 25 pelicans have been brought to a wildlife rehabilitation center in the San Pedro district of Los Angeles, International Bird Rescue said. The big birds are showing signs of emaciation, hypothermia and anemia, the organization said. It's normal to receive recently fledged baby pelicans this time of year but the current wave includes many second-year birds, said Kylie Clatterbuck, the center's manager. The organization said there have been many cases of pelicans landing on city streets, residential yards and airport runways. 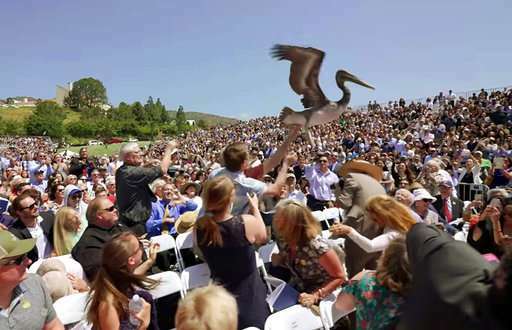 A well-publicized incident occurred April 28 when two pelicans landed at Pepperdine University's graduation ceremony in Malibu. "They just don't want to fly," said Russ Curtis, a spokesman for the organization in San Francisco. The group has not yet sent any pelicans to labs for necropsies because it has been inundated with the task of taking care of the arriving birds, he said. There have been past incidents of California brown pelicans being sickened by domoic acid, a toxin produced at times by algae. It enters the food chain when fish eat the algae. Curtis said, however, that the famished birds don't show the neurological problems typical of domoic acid outbreaks such as spasms or inability to hold their heads up. "It's still a mystery," he said. 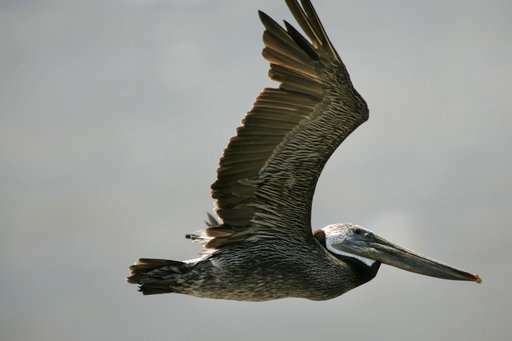 Pelicans are normally seen flying in formations, sometimes gliding just above the ocean surface. To feed, they circle high above the water to spot prey and then dramatically dive to catch fish with their long bills.